Americans are taking more prescription medications than ever before. According to the Centers for Disease Control and Prevention (CDC), nearly half the adult population in the US has taken at least one prescription medication in the past month; over 23 percent have taken three or more prescriptions in the past month; and almost 12 percent have taken five or more prescriptions in the past month. While many of these prescriptions are vital treatments for serious conditions, including chronic pain, heart disease, or diabetes, many more are intended to be temporary. Some of these medications can cause unintentional euphoria or make the individual taking them “high.” For millions of Americans, this high has led to substance abuse. Below are the five most abused types of drugs in the US, which are still prescribed widely to millions of people every year. Opioids: Since 1999, according to the CDC, medical professionals changed prescribing practices to distribute opioid painkillers to more people to manage pain. The idea stemmed from a need to reduce suffering, especially after surgery or an injury that would heal. 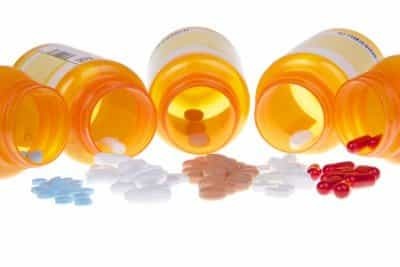 Hydrocodone and oxycodone medications were widely prescribed, which, unfortunately, led to millions of people all over the US struggling with these substances.Between 2000 and 2015, a half-million people died from opioid overdoses. While more and more of these overdoses involve illicit drugs like heroin and street-grade fentanyl, most people who now abuse heroin began with prescription analgesics. Between 2005 and 2012, as doctors and lawmakers began to closely monitor how many prescription opioids were being consumed, the number of people struggling with heroin addiction in the US doubled, from 380,000 to 670,000, according to the National Institute on Drug Abuse (NIDA). Benzodiazepines: People who struggle with anxiety, panic disorders, or insomnia benefit greatly from short-term access to fast-acting medications like benzodiazepines, including Valium, Xanax, Klonopin, and Ativan. Unfortunately, benzodiazepines act on the GABA receptors in the brain, leading to a sense of wellbeing and relaxation much like alcohol induces, which can lead to abuse, addiction, and overdose.Some physicians now consider benzodiazepine abuse to be a “shadow epidemic,” alongside opioid abuse. One study found that, between 1999 and 2010, overdose deaths involving benzodiazepines quadrupled. Many people who struggle with benzodiazepine abuse typically mix these drugs with other substances, which increases the risk of an overdose. Antidepressants: Drugs like selective serotonin re-uptake inhibitors (SSRIs) and monoamine oxidase inhibitors (MAOIs) are not considered addictive because they do not cause an immediate intoxication. However, the CDC found that, between 2005 and 2008, about 11 percent of Americans ages 12 and older took antidepressant medication, and about 60 percent of those individuals had taken these medications for two years or more.While antidepressants are very helpful, like other prescription drugs, there is a growing body of evidence suggesting that some individuals abuse these substances. Initial research into who abuses antidepressants suggests that most individuals struggle with polydrug abuse, and also tend to abuse alcohol, marijuana, opioids, or other substances alongside antidepressants. Additionally, antidepressants can cause withdrawal symptoms when stopped suddenly, and for some people, those symptoms may include cravings and compulsive behaviors around intoxicating substances. Stimulants: Prescription stimulants are typically prescribed for attention deficit hyperactivity disorder (ADHD), although many can also be prescribed to treat sleep disorders like narcolepsy. Teenagers and young adults are most likely to abuse prescription stimulant drugs, such as Ritalin, Adderall, and Vyvanse, through a mistaken belief that these drugs enhance performance. Because their peers with ADHD experience cognitive and academic improvements while combining stimulant medicines with Cognitive Behavioral Therapy, young people without ADHD may believe that the drugs alone lead to improvements. This had led to the rise of “study drug” abuse, which is now crossing over into people with stressful work schedules abusing them as well. Sleep aids: Non-benzodiazepine sedative-hypnotics were developed as safer, less addictive alternatives to barbiturates and benzodiazepines to treat insomnia or other sleep conditions. However, like their predecessors, sedative-hypnotic drugs are abused for non-medical reasons and can be addictive.Ambien and Lunesta, two of the most popular sedative-hypnotic drugs, are abused, often alongside other drugs like alcohol, narcotics, or benzodiazepines, in order to get high. This is very dangerous, as the side effects of sedative hypnotics often involve parasomnias like sleepwalking or sleep-driving, which can cause severe injury or death.